We don’t have to imagine a world without guns. Humanity already lived through it. For those who wish to avoid gun violence in particular can always go to Burundi or Rwanda…the locals favor machetes there. Somehow, that environment doesn’t seem nearly as safe as the more firearm-friendly America. This entry was posted in knife, rkba, self-defense, weapon and tagged armor, chainmail, Medieval, sword, viking. Bookmark the permalink. 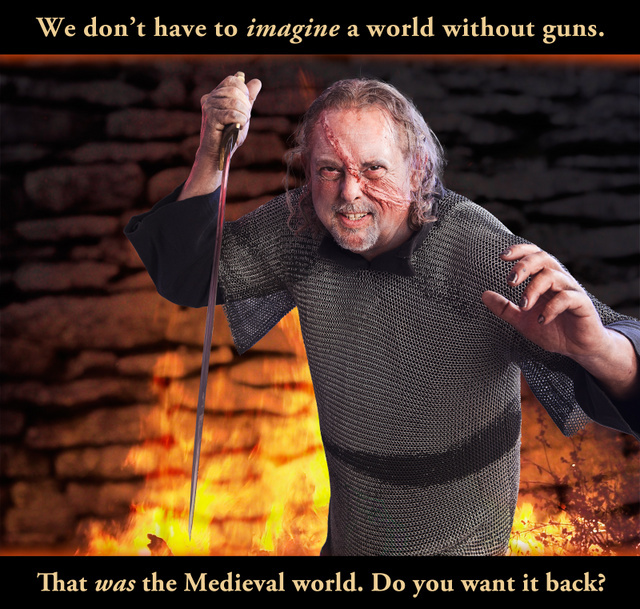 12 Responses to We don’t have to imagine a world without guns. Humanity already lived through it. Framing the problem as “gun violence” ensures that the true problems will never even be addressed. Quick, what were the three worst mass killings since 1990? Happy Land arson, NYC, 87 lives. Murrah Building bombing, Oklahoma City, 168 lives. Not a single shot fired. We run in the same circles, Turk. People are people, good and bad. For all people say, we got this far. Impressive. Tirzah did a good job and the photo is good also. They didn’t call it “the dark ages” for fun. Is there a reason for the strange choice of sword grip? I realize it makes the picture easier to frame, but to anyone who’s learned to use a sword… well, its rarely the most effective way to hold a knife. Its a damn silly way to hold a cutting /slashing weapon. No force in any normal attack and a weak grip. Anyone coming at me like that would find their sword on the ground and mine at their throat in very short order. Look at his face, it appears someone already tried to teach him that lesson. Keep in mind that he’s menacing the viewer, not an armed opponent. Like LarryArnold said :It wasn’t called the Dark Ages for Grins & Giggles. It was a time when everyone’s life could summed up in three words —NASTY ,BRUTISH & SHORT.